Gone Fishing » Blog Archive » Jacobsbaai. 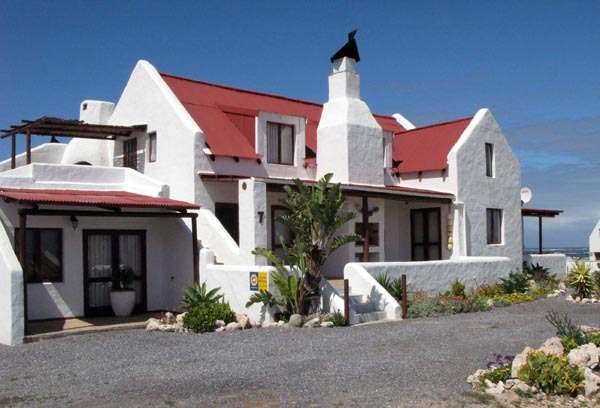 Situated on the coast between Saldanha Bay and Paternoster lies the picturesque retirement and holiday village of Jacobsbaai. 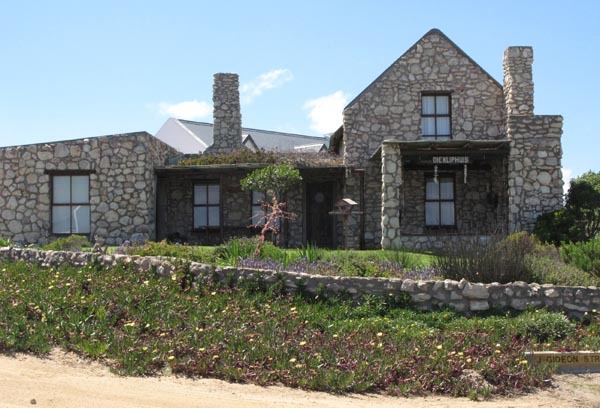 The turn off to get to Jacobsbaai is on the Saldanha Bay – Vredenburg road, just outside Saldanhna, and the road, until fairly recently was a not so good gravel road. 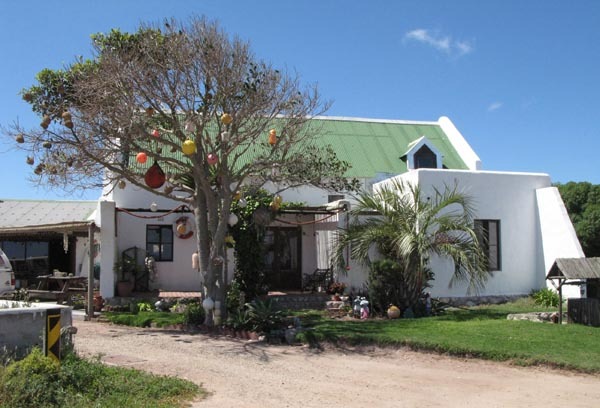 Jacobsbaai is out of sight of the bordering developed towns and the main traffic flow of the area and is also surrounded by agricultural land and natural vegetation. It is the kind of place you don’t just stumble upon but rather have to know about and make an effort to get there. 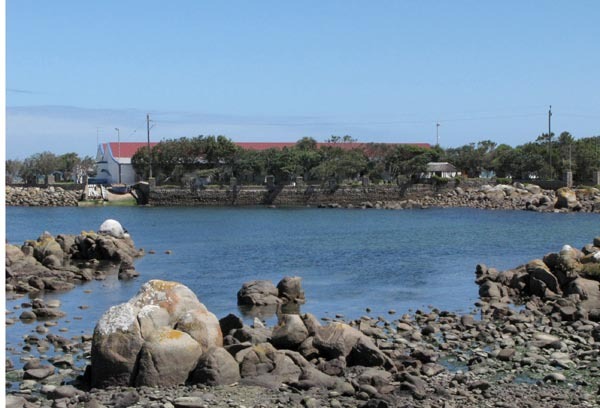 Part of Jacobsbaai’s 2km coastline. The pristine beach area which is on the northern side of the village called Hospital Bay. 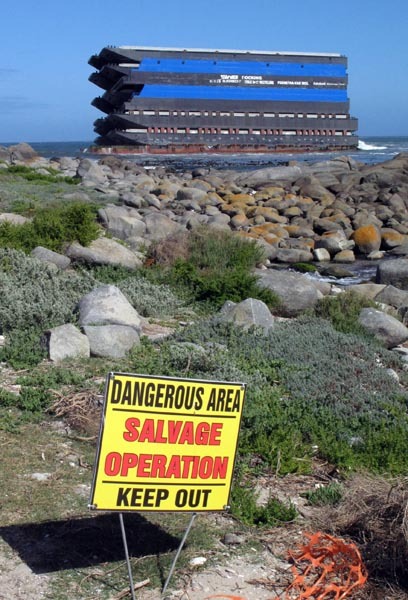 As one arrives in Jacobsbaai there is an extraordinary sight that greets you. 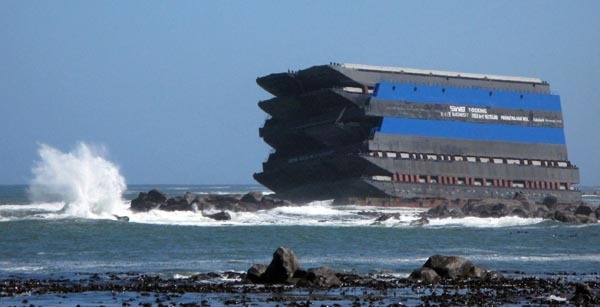 On the 24th June 2009 a barge, the Margaret that was being towed from Durban to the Netherlands, ran aground and is still stuck on the rocks. It is a huge multi decker barge and there is no way that you can miss seeing it. The Margaret stuck hard and fast on the rocks. There are plans to try and salvage either the barge or at least the cargo. 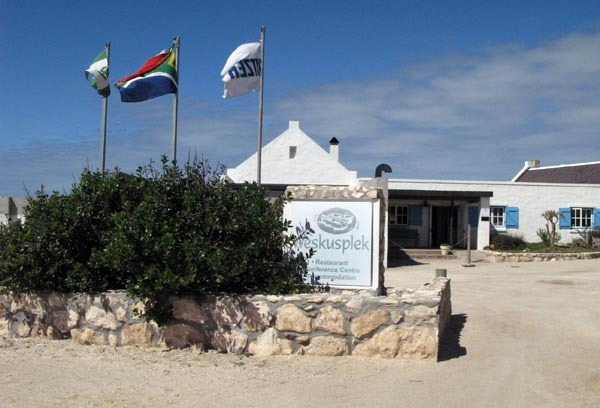 Weskusplek is an 80 seater restaurant, holiday and conferencing resort, uniquely situated on a narrow peninsula between Jacobsbaai bay on the one side and the white-sand beach of Hospital Bay on the other side. 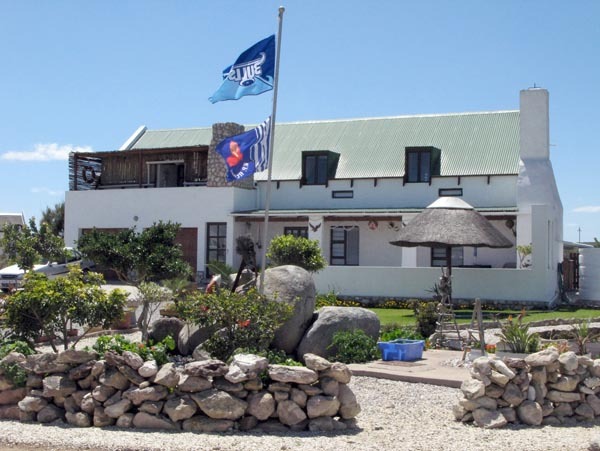 Weskusplek is also sometimes referred to as “Steve’s place” after Steve Hofmeyer, a well known South African entertainer, who is a part owner. I say multifunctional as it is also used as a wedding chapel and on the day I was there was being prepared for a whole crowd to gather and watch the semi finals of the Currie Cup rugby competition. 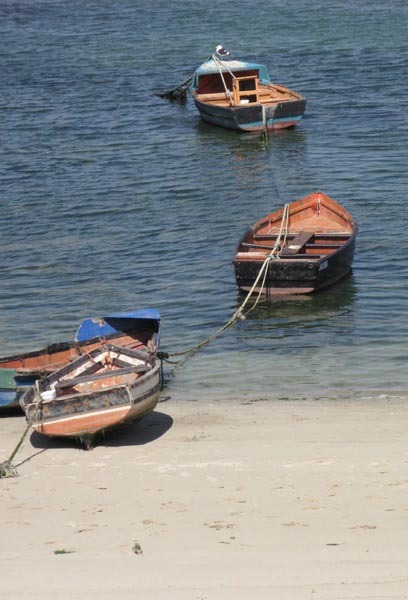 Fishing boats waiting for the right conditions to put to sea. 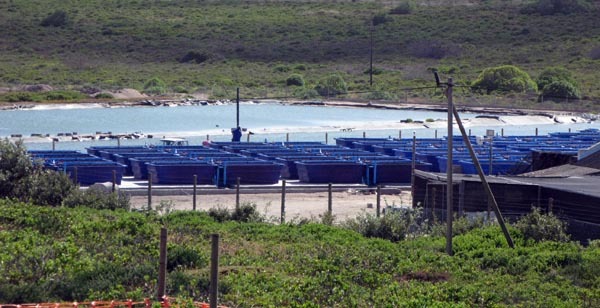 As with many of the coastal towns there is a lot happening in the Mariculture Industry. Looking across another small bay at a place called Live Fish Tanks. At Live Fish Tanks they pack live West Coast Rock Lobster (crayfish) for export to to Europe and the far east. 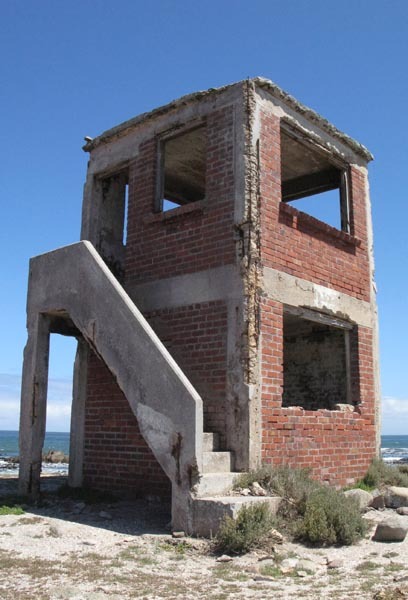 An old look out tower on the south side of Jacobsbaai. 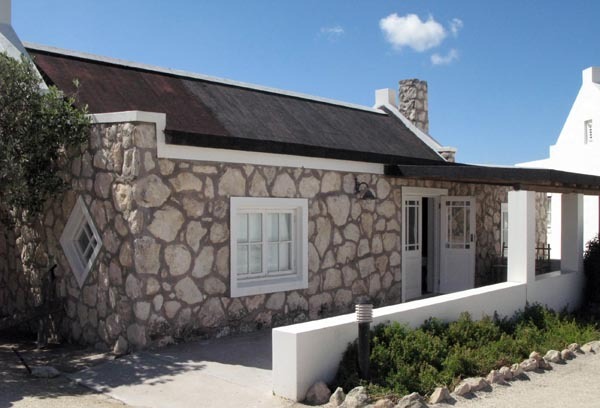 1st house built at Jacobsbaai. Stopped and had a chat to the owners of this house who told me they were the first to build at Jacobsbaai only 17 years ago. An interesting fact is that of the over 300 houses here 80% are occupied all year round. They reckon that once you stay here you never want to leave. As you can see there are some good looking houses. They got the rugby result correct – Blue Bulls on top and WP at half mast. Probably the most practicable finish you could have for a house at the sea. This was only the second time I had been to Jacobsbaai, the first was for a photographic assignment some months ago, and after having had some time to explore and have a good look round I really enjoyed the village and can understand why people don’t want to leave. 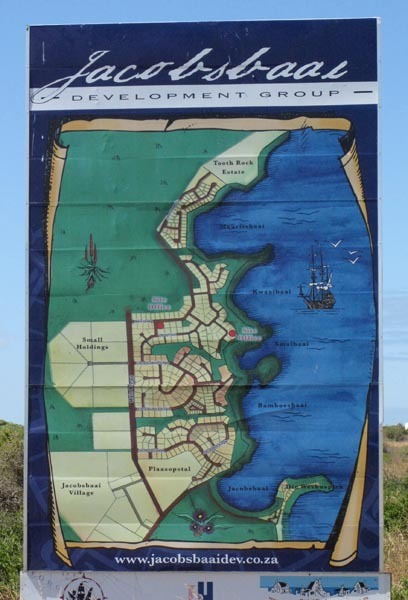 It is only 140km’s from Cape Town and also close to a new modern shopping centre outside Vredenburg. It has a moderate climate, great seafood restaurant and there is good fishing, crayfish diving in season, small boat access, bird life and walking trails. Hi Michael not to sure but I think abalone. These places are always all locked up and I can never find anyone to chat to. I love Jacobsbaai! When I visit my friend in Saldanha, we always drive out to there. I’ve never been here – looks like a lovely spot. Is it windy? If you want a place that all you can do is relax then this is it. Like most places along the west coast it is pretty windy. Awesome post .. this is heaven on earth in my humble opinion. 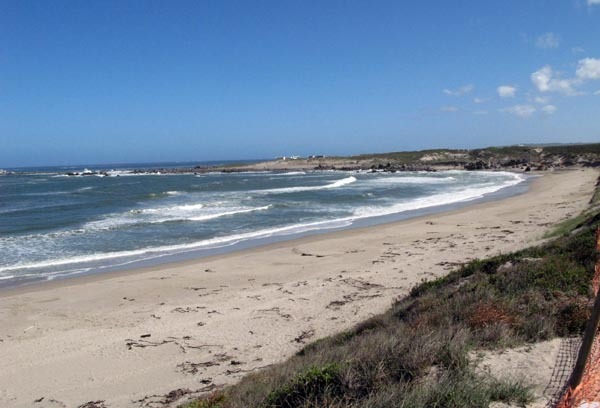 Jacobsbaai, more specifically Swartriet, is a wind-surfing hotspot. By the way (for foreign readers) the Margaret is no more. As far as I know four barges bottom barges were gradually collapsed in a blast leaving the land side in tact and the seaward side so that the floating Dry Deck on top tilted down towards the sea to “deliver” 6 barges. Hi, what a great site. The “good looking” house with the red roof is mine. Am I not a lucky girl. Thanks for the complement. Hi Isabel – you are indeed a lucky girl and thanks for the compliment on the site. Hi Guys – there is crayfish in the blue containers. You can go in there and look but I am unsure what is housed at Jocobsbay sea products ( on your left when going to Weskusplek ) I went there once and now have a holiday house there. I fell in love with the place and cant stay away. Given half a chance I go there. I like the site I found it by chance and it is a great site to show people when they ask where Jocobsbay is. In my 2 years of Jocobs i have yet to catch the all elusive Kabeljou that everyone talks about from the “platklip” opposite Weskusplek. Amen Line. Thank you for the link .. sit nou sommer met tranerige oe na die gallery en kyk terwyl my hart homself stukkend verlang na daardie stukkie hemel. We stopped off here four years ago and have never left. My lifestyle is to be — > At, on, in or under the sea and there is no better place for this experiance. Hi Raymond – I loved it there! Almost like being at the edge of the world and yet you are pretty close to all the shops when you need to be. 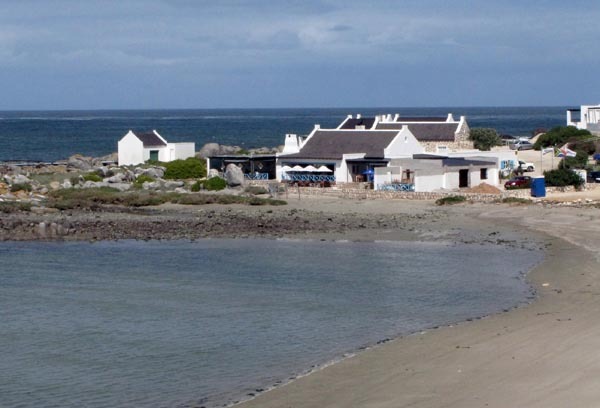 Someone at work mentioned Weskusplek at Jacobsbaai and when visiting the West Coast during flower season in 2012 went to look for it and immediately fell in love! Have been back every year since and have a “home coming feeling” every time I drive towards Weskusplek. It is indeed a little piece of heaven on earth. Was there 2 weeks ago and as ELF mentioned, not much left of Margaret – rusty wreckage blending in with the rocks – hard to believe that it once was like a multi-storey building! Unfortunately don’t have a website, else would have posted a picture of what it looks like now. For those of you who live there – jealous greetings!